Back before your BFF stole your BF, before we worried about WWJD or you "went postal" because your neighbor was all NIMBY about you wanting to put your car up on blocks, we all tried to go KISS by using actual words to converse. If you've seen a teenager's cell phone lately then you realize that those days are long gone. Today reading a text message is akin to rummaging through the aftermath of an explosion at the alphabet soup factory. CC1 and 2's thumbs fly across the keypads of their phones only to result in messages that look more Cyrillic than English. I know I sound old, but is it too much to ask what happened to vowels? I understand that language evolves and changes on a regular basis, I'm just trying to figure out when dictionaries were taken over by the publishing house of Dyslexia & Aphasia. Alright, alright, put on a sweater and have some tea old crab. Besides it's not like you don't change recipes to suit your needs. You're right. I do change recipes all the time, but I like to think that the result still vaguely resembles the original. Lightly oil a small baking sheet. Beat the egg in a large bowl. Whisk the stock, semolina flour, and salt in a heavy medium-sized saucepan over medium heat until the mixture bubbles and is very thick (about 10 minutes). Don't walk away - hover over the pot and whisk constantly! Using a wooden spoon, gradually beat the hot semolina mixture into the egg. Transfer the gnocchi mixture to the prepared baking sheet, spreading it to form a 1/2 inch thick layer. Move quickly as the dough gets stiff as it cools. Refrigerate until the gnocchi mixture is cold and firm, about 1 hour, or longer if you need to. Preheat the broiler. Generously butter (2 TBSP) a 10 inch diameter baking dish. Using a 2 inch diameter cookie cutter, cut out rounds from the gnocchi slab. Melt the remaining 1 tablespoon of butter and brush over the arranged gnocchi. (You can prepare the gnocchi ahead of time up to this point and refrigerate.) Sprinkle with Parmesan cheese and pepper. Broil until the gnocchi are heated through and golden brown, about 6 minutes. Voila! A moderately easy recipe that does require a little work and wait, but it's a nice change from the traditional approach. You can serve this as a side dish, or maybe as a first course if you add a little sauce to it. Oh, one more thing, this is the kind of dish that only gets better with a little more melted/crispy cheese, so I always recommend putting on more grated Parm before the broiling starts. OK crablings, that's it for today, remember U can do it U can cook; C U L8R. WTF What the heck * Replace heck with four letter word beginning with "f"
I've been meaning to try out this recipe for a while - it looks great! Appreciate the translations..I can't even understand the text messages from my own friends..I think a comment was made about popular culture just passing me by ( I was in the kitchen, you see!) 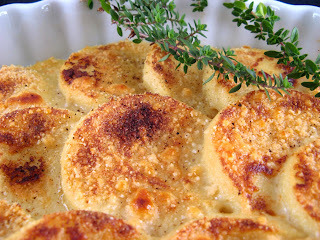 This Gnocchi looks divine..I have no dinner tonight - PTA meeting (heehee), Parent Teachers Association, so think of me as I munch my cheese sandwich! !..with a glass of wine, of course, I am in France! Love this recipe! I've made it before and highly recommend it. 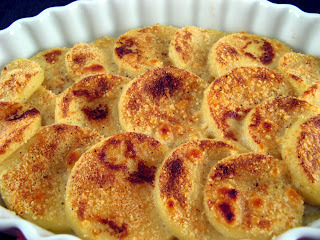 I have been wanting to try making gnocchi alla romana. It looks good! I really like that golden brown top. You dont need me to select a wine. Select your favorite European Dry white wine. Easiest to find white wine from Rome is Frascati. Inexpensive, dry and light. But the Romana doesnt mean Rome here, but rather the Emilia-Romanga region due to the use of the cheese. But Gnocchi is from further north in the shadow of the Italian Alps. I would serve a Tocai Fruilano. It has more flavor than Pinot Grigio and the same lightness of body. Pinot Grigio from Fruili works too. NOT FROM VENEZIE. we add a touch of cream to our butter sauce on gnocchi a la romana. it adds just a bit more richness but also helps them brown well.